Does purchasing spring onions not seem like an awful waste? I mean they do work exceptionally well in salads, quiches, as pizza toppings and, well, anything that you’re feeling too lazy to chop up an ordinary onion for. However, that’s just the white ‘rooty’ part, and not the whole spring onion. So what on earth do you do with the rest – i.e. the majority – of the onion? In my house the dark green fronds often face a grisly execution on arriving home from the supermarket. They take up so much blasted room in the fridge, weep gunk all over the place and generally disintegrate into a state of oozy floppiness that we usually resort to giving the bunch of spring onions a good ol’ haircut with the kitchen scissors before relocating them to their new home. Fortunately this Fried Tofu Salad with Chilli Peanut Sauces changes things. Because, wait for it….it only uses the dark green part of the spring onion. I’d like to say it was a stroke of genius on my part but it aint. Truth be told I’d already selected the recipe before cottoning on to its clever inclusion of the poor abandoned green parts. This recipe involves chopping many of the ingredients into dainty proportions. But don’t be fooled. This is no delicate salad. Consumption requires both a knife and fork. It’s a good and proper meal. 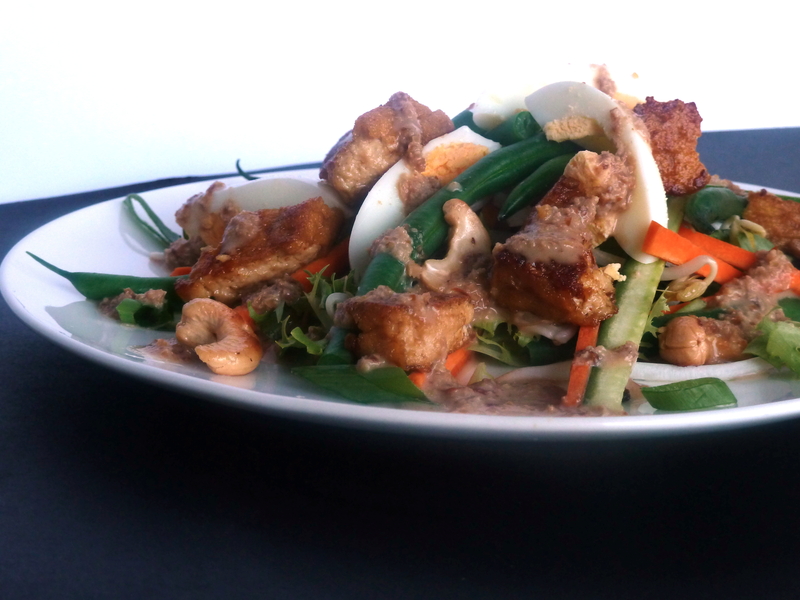 Boiled egg, nuts (peanuts or cashews work equally as well) and chunks of crispy pan-fried tofu give this baby real grunt. There’s matchstick sized strips of crunchy carrot, anorexic-lengths of cucumber, the aforementioned spring onions (green bits only! ), green beans and bean sprouts to provide a contrasting crunch. Oh, and a handful of lettuce for good measure. It is a salad after all. We also can’t be forgetting the chilli peanut sauce. It certainly doesn’t look that appetising, far from it, with its brown sludge-like appearance. That’s misguiding – it tastes fan-tiddly-astic. Cheat and use store-bought satay sauce if you’re in a pinch for time, but only as a last resort. Not only is the home-made version superior in flavour, it’s also free from all those evil added sugars and hydrogenated vegetable oils. Furthermore, you can prepare the sauce in advance and store in a well-sealed jar in the fridge for up to a month. The salad calls for just over half of the sauce produced, so you’ll have some nifty left overs to jazz up a stir-fry or curry, or use as a dipping sauce (FYI it tastes great with rice paper rolls). With that in mind, you really don’t have an excuse not to make it. Simon Bryant notes in his ‘foreword’ to the recipe that after spending hours on end prepping food in smelly, sticky hospitality conditions this salad, with little cooking involved and a crisp finish, is a wonderful solution to consequent meal-time dilemmas. I completely agree – it’s one of my go to foods after a day at the cafe. Crisp, fresh and oh-so satisfying. If you’ve never tried tofu before this salad is a superb introduction…you wont find any bland, soggy specimens here! Bring a small pot of water to the boil. Tip in the green beans and cook for one minute. Drain and then immerse in a bowl of iced water to refresh and prevent further cooking. Set aside. Warm the oil in a frying pan over a medium to high heat. When shimmering add the tofu and cook, stirring frequently, for about five minutes or until golden-brown and crisp on the edges. Transfer to a plate covered in paper towel to drain off the excess oil. Pour out any oil remaining in the pan (but don’t clean or wipe out the pan – you want just a smear of oil left) and return to the burner on a low heat. Toss in the peanuts/cashews and toast for a minute or two, shaking the pan regularly, or until lightly browned. Allow to drain with the tofu. Season the tofu and nuts with a little sea salt. Place the chilli peanut sauce in a small saucepan over a low heat and warm gently for a minute or two. Add hot water to thin out the sauce to an almost pouring consistency, stirring well after each addition. Divide the lettuce, green beans, carrot, cucumber and bean sprouts between serving bowls/plates. Top with the boiled egg, fried tofu and nuts. 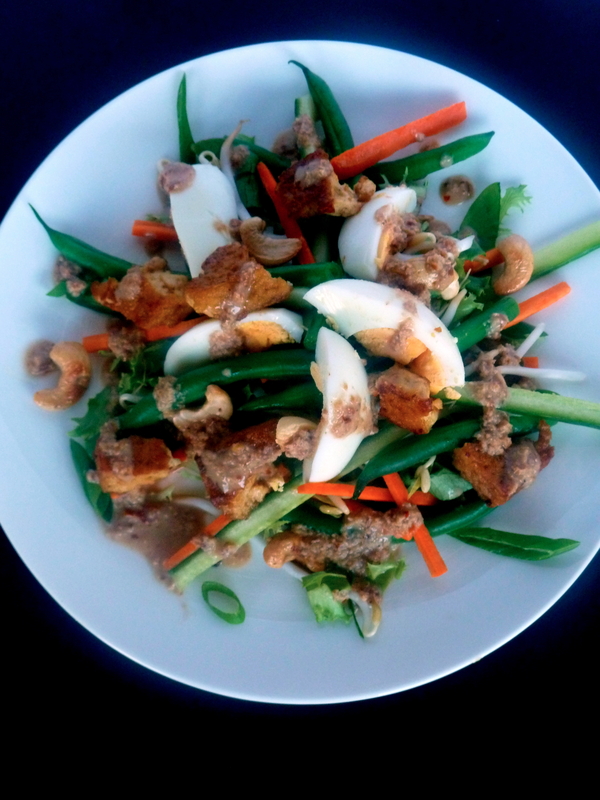 Drizzle over the chilli peanut sauce and sprinkle with the spring onion ‘diamonds’. Source: Adapted from Simon Bryants Veggies. Place the dried chilli in a very small bowl and pour over the rice vinegar. Leave to marinate for 15 minutes. Meanwhile, spread the peanuts out on a small baking tray and roast for ten minutes or until lightly golden. In another small bowl, whisk together the soy sauce, kecap manis, garlic and palm sugar. Set a small saucepan over a medium heat and pour in the oil. When hot, add the chilli and vinegar mix and fry for a few seconds, stirring constantly. Tip in the soy sauce mix and cook, still stirring, for a further 30 seconds or until it starts to froth. Add the peanuts, stir to coat, and then pour in the coconut milk. Reduce the heat to low and simmer gently, stirring every once in a while, for approximately 12 minutes or until the sauce has begun to thicken. Blitz in a blender/food processor until relatively smooth (you will still have fine grains of peanuts visible, that’s ok). Store in a sterilised jar, in the fridge, for up to four weeks. When required, warm gently over a low heat and thin out with hot water to reach desired consistency.